Let us be charitable and forgive Interior Secretary Ryan Zinke for his blunder last month when he proudly placed on his head a U.S. National Park Service flat hat — backward. These things happen. Somehow, though, I doubt that he ever wore his Navy SEAL ribbons or pin insignia upside down. I was a park ranger once, and I made mistakes. The day before Interior Secretary James Watt visited Alaska’s Denali National Park in 1981, a fellow ranger told me I should stop wearing red socks. He was right. The National Park Service uniform mattered. It still does and always will. It speaks to mission and respect. It shows that we care deeply for the welfare of our public lands in general and our national parks in particular. Parks are not just scenery but also history and ecology; they are sources of education, innovation, provocation and inspiration. Consider that 80 percent of Earth’s natural forests have been destroyed; that mercury, plastics and other pollutants are everywhere, from the highest mountains to the deepest oceans; that 96 percent of all mammal biomass now consists of human beings and our livestock and our pets. Or that today’s extinction rates are estimated to be 1,000 to 10,000 times above average historic levels. Where then can we find a corrective lens, a better definition of success and ourselves? Open space. The big quiet. “Now I see the secret of making the best person: it is to grow in the open air and to eat and sleep with the earth,” wrote Walt Whitman. In essence, our interior secretary is a health professional in charge of America’s largest medical clinic — our public lands. He can be a brake on the wheel of our own self-destructive machine, if he so chooses. When Watt did visit Denali in 1981, I smiled and greeted him with my NPS green and gray, my gold badge and my standard-issue brown socks (and my flat hat on properly). We got along just dandy. Newly appointed by President Ronald Reagan, Watt was a near-sighted champion of capitalism and Christ who appeared mildly uncomfortable in his new job. Earlier, while floating the Colorado River through the Grand Canyon, he had prayed for a helicopter to come take him out, saying, “I don’t like to paddle, and I don’t like to walk.” Watt lasted just two years in the job before his habit for creating controversy did him in. 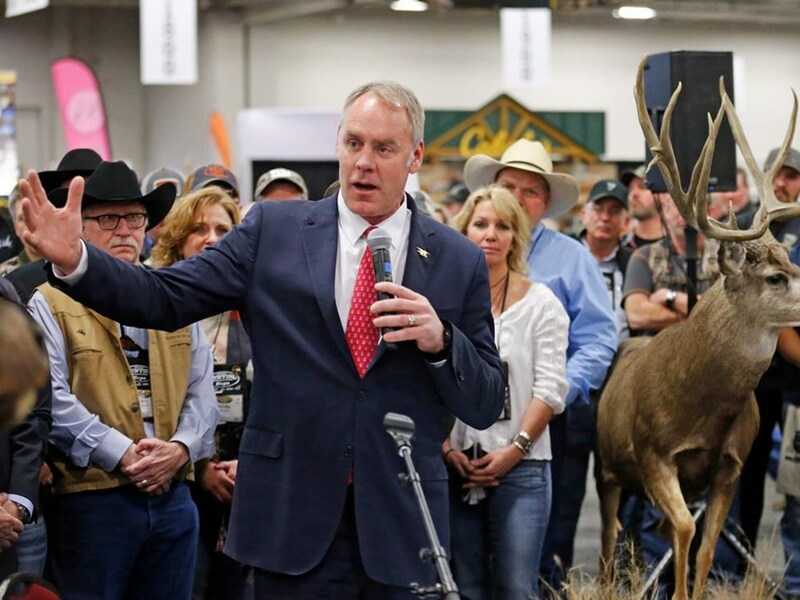 More than a few critics have said that Zinke reminds them of Watt. Again, let us be charitable. I encourage Zinke to read the great American preservationist writers, such as Whitman, Henry David Thoreau, John Muir, Aldo Leopold, Marjory Stoneman Douglas, Robert Marshall, Rachel Carson, E.O. Wilson, Carl Safina and Terry Tempest Williams — for starters. And don’t forget Stegner and Abbey. It’s never too late to learn; to discover what Leopold called an “ecological consciousness” that defines nature not as a commodity we own, but as a community we belong to. Get away from those sticky oilmen who can hear a dollar bill fall on the rimrock — men who would watch the world burn to increase their profits. Good interior secretaries hold on to what we have. They add to America’s résumé of stunning public lands. They never dismantle existing national monuments or drill for oil in wildlife refuges, as Zinke intends. And they don’t appoint wildlife boards loaded with trophy hunters. Put on that NPS hat — properly. Walk with us and see the folly in what you’ve done. It’s a simple matter of ethics and morality. Yes, we could squeeze more money out of every acre. We could also make a full meal of a bald eagle. But it’s not the right thing to do. We’re not that hungry and not that desperate. We are charitable. Luv the article!! EXCELLENT, no doubt! It would be good for the president to get out of the high-rise “tower” and experience some of our Public Lands. He would. perhaps, understand what REALLY makes America Great.